Coburg have given Footscray a run for their money and an almighty scare, kicking the final six goals before the clock ran out as the Bulldogs took a 10-point win. A fast start from both teams early had the two clubs on even terms mid-way through the first quarter. Peter McEvoy kicked his first of the day to give Coburg the early lead, before Footscray kicked a couple off the back of turnovers, leading the Lions by three points at the end of the first quarter. Some errors up forward for Coburg allowed Footscray to spend a lot of time in forward 50, but were unable to capitalise for the most part due to Coburg’s strong defence. Tempers flared as Footscray felt the pressure from the Lions who were down by 17 points entering halftime. It was a hard ball to win in the third term, with congestion around the football at a maximum for most of the quarter. Footscray were able to gain a 27-52 lead before a tough kick from Mitch Conn gave Josh Weightman a gem in front of goal; bringing Coburg back within range. A hard-tackling Coburg gave Footscray all kinds of problems for the rest of the quarter, with the Lions down 17 points at the final break. The one thing that hurt Coburg all day was costly again at the start of the fourth, with turnovers leading to multiple Footscray goals. The margin grew to 35 points before Coburg began to control the footy and turn it up another gear. Coburg attacked through the corridor, putting Footscray under all kinds of pressure and managed to kick the next five in a row. The crowd was up and about and in full voice before Hisham Kerbatieh kicked a possible goal of the year candidate, sending the crowd into a frenzy and bringing Coburg back within 10 points. 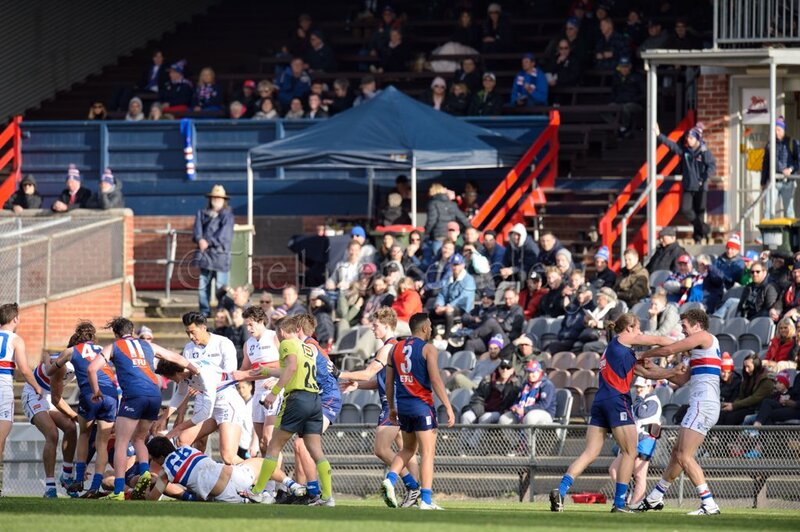 It was the final siren that saved Footscray from a mammoth comeback by Coburg however, which left its run a bit too late. Speaking with assistant coach Tom Curran after the game, he said that despite it being another loss, there were a lot of positives to take away. Curran also gave “full credit” to the backline, considering the number of Footscray inside-50s being quite high. Next week Coburg will take on Casey at Casey Fields.